Celebrate the true meaning of Christmas with these beautiful crochet Nativity patterns. Whether you make it to give it as a gift or keep it for yourself, it is sure to become a treasured family heirloom. No matter if the Nativity is for a child or an adult, there are quite a few crochet Nativity patterns currently available to suit any taste. ✅ No time to read this now? Click here to pin this post for later! When I was a kid, my great-grandmother made me a crocheted Nativity set. Unfortunately, I was a careless child and lost most of the pieces. As an adult, I deeply regret not taking better care of something that was so lovingly made for me. Thus began my quest to find a crochet Nativity pattern to attempt to recreate what was lost. 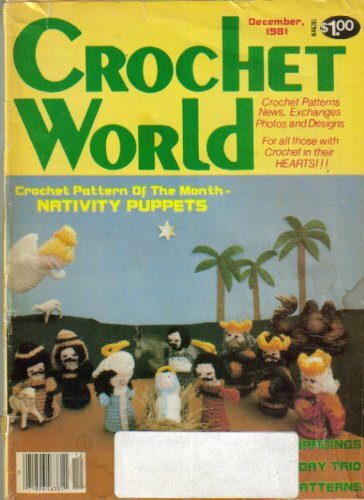 According to my mother, my great-grandmother had found the crochet nativity pattern in one of those 1970’s craft magazines. Since I had no way of knowing which magazine the pattern came from, it was like searching for a needle in a haystack. In the past several years however, crochet Nativity patterns have started popping up here and there for sale online. I have purchased several of these patterns and I was finally able to make my own crocheted Nativity set! Of course I will never be able to reclaim the one my great-grandmother made me, but I do have the joy of being able to make crochet Nativity sets for each of my children. This adorable pattern from Gourmet Crochet is probably my favorite crochet Nativity set pattern that I have found. I am currently in the process of making a set of one of my daughters. Each figure is 4-5 inches tall and is entirely worked in single crochet. It only takes me a few hours to finish one of the figures. This amigurumi Nativity pattern is available as a download. I love pattern downloads because I can print a copy to work from and cross off the steps as I complete them. Then I can print another copy the next time I want to make it. The Benefit of e-Patterns: I really like e-patterns because I can print them over and over again. If my kids spill a glass of milk on a regular pattern booklet, it gets ruined, and I have to buy another. If something gets spilled on a printout of an e-pattern, no big deal. I just print it again. The pattern is super simple, as it only uses single crochet stitches. It would be a great crochet Nativity pattern for beginners. I am enjoying how quickly the figures are working up. So far I have completed 3 figures from the Gourmet Crochet Nativity pattern. Above are the baby Jesus, Mary, and Joseph. Here is a better view of the Baby Jesus. I love how the pattern included yarn straw for the manger! I hope to finish this pattern up this year and will update the post with pictures of the other figures when I am done. Although the pattern doesn’t call for it, I recommend putting about 10 marbles in the base of each standing figure as your are stuffing it. This adds some weight to it so the figure so it stays upright better and doesn’t fall over as easily. Buy all the materials you need to complete your project before you get started. Nothing is worse than being close to finishing a project only to run out of yarn and discover that color has been discontinued. Ask me how I know that! When crocheting in the round, use a bobby pin to help keep track of the first stitch in each round. The bobby pins slip in and out of the stitches easily, and you don’t have to unhook them like regular crochet stitch markers. The Away in a Manger pattern is closest one I have found to the crochet Nativity that my great-grandmother made me when I was a child. After I finish the Gourmet Crochet one (which will eventually go to my oldest daughter), I am going to be making this one to display during the Christmas season as a tribute to my great-grandmother. Sometimes it’s just easier to work with a kit. 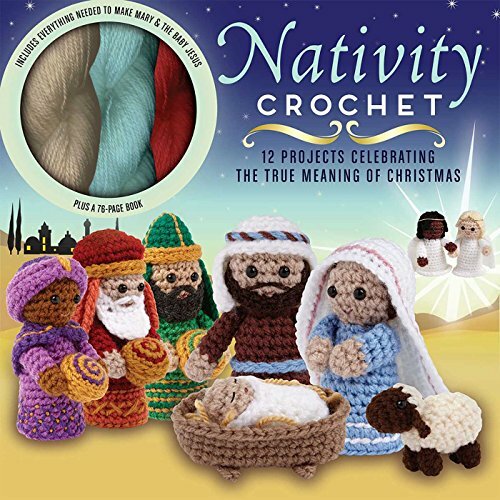 If you want the pattern and all the yarn and materials needed to make a crocheted nativity, then this crochet Nativity kit available on Amazon is for you! Even better – it’s eligible for free Prime shipping! The kit contents include all supplies needed to make Mary and the Baby Jesus. The kit also comes with a 76 page pattern book that includes instructions to make 10 additional projects – Joseph, the Wise Men, a shepherd, and angel, animals, and a star. In the mood to start some projects for Christmas? Be sure to check out all of my Christmas crochet projects. So tell me… Have you started crocheting anything for Christmas this year? Which of these crochet Nativity patterns is your favorite? If you have any questions or comments about crocheting, feel free to leave them below.